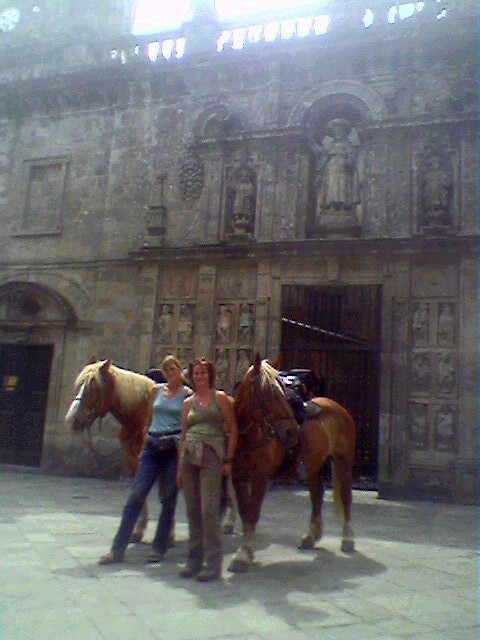 Jeannette van den Eng and Margriet Dijkstra are riding from their home in The Netherlands to Santiago di Compostela. Having visited your excellent site before to pick up a few tips, I felt I should write to you when I read about the two Dutch guys riding from France to The Netherlands. That's because we, two Dutch 'girls' will be riding from the Netherlands to Santiago de Compostela in Spain, starting on the 31st of March this year! 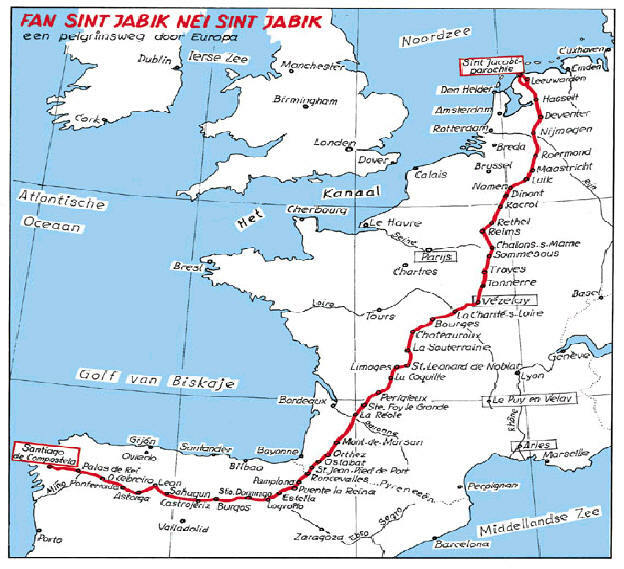 (So we might be able to meet up with the guys somewhere in France...) We hope to reach Santiago (almost 2,500 kilometers from Nijmegen) in the beginning of August, after about four months travel on horseback. We're doing this not only because we love trail riding, but also to raise funds for disabled riders. I'm not sure if you'll be able to understand the Dutch (I'm working on an English summary), but please have a look at our website: www.paard-en-kracht.nl. 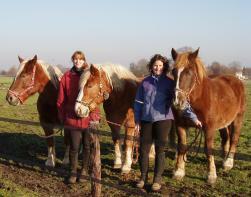 We'd like to be included in your expedition list; our names are Jeannette van der Eng and Margriet Dijkstra, and we will be riding the lovely Noriker ladies Liesa, Roos and Linda. Our three sturdy Austrian horses are 10, 12 and 13 years old; as fillies they have wandered the alms in the Alps for a few years, so training rides in the hills around Nijmegen are a piece of cake to them. Click on map of route to enlarge it. We're meeting up with Hans and his companion next week, and leaving in 4 weeks! How time flies. 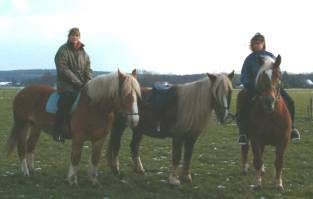 This photograph shows Jeannette on Liesa, Truska, and Margriet on Roos. Thanks for putting us on your website - we refer to you on ours! It has already put us in contact with among others Richard Sharp (living in France), who wants to do a long trek this summer and would like to join us part of the way on his Breton mare. We're back from Santiago, safe and sound! It's been a wonderful adventure and a huge learning experience - even for seasoned trail riders like us. And the horses have learnt a lot too; for example, our slightly nervous packhorse Roos turned out to be a bold leading horse and led the way through Spain. It's hard to tell our story in just a few paragraphs - we were on the trail for four months, slept in over a hundred different places, and met a huge number of extremely nice people. We were 'picked up off the road' a few times; people driving by would just stop and talk for a minute, and then offer us a place to stay for the night. We were invited into homes, slept in guestrooms, given food and shelter and a warm welcome, and sometimes even the car keys! One of the things we learnt is that there are a lot of really kind and generous people out there, even in modern Europe. Our horses did great. When we started out, we wondered if they would tire of trekking to a new meadow again and again. But they didn't; every morning they would come and greet us (of course helped by the fact that we fed them while saddling). As light draught horses, they have a cool head, but still stayed calm while walking in the verge of main roads, with big trucks passing close by at 80 kph or more. Hills and mountains, brooks and lakes: no problem. They didn't like the sea, though. The waves were too scary. We seem to be the first to ride from Holland to Santiago (if you know better - tell us! ), but to our surprise we had another first. We were told we were the first foreign riders on the Camino del Norte, the Spanish coastal route to Santiago. It's much cooler and greener than the well-travelled Camino Frances, a bit further to the south. Although it's hillier (no problem for our Austrian mountain horses) and has more roads (you really need horse-shoes with borium to give the horses grip on the slippery Spanish asphalt and concrete roads), Liesa was still a bit too heavy when we arrived in Santiago, thanks to the grassy meadows we found almost everywhere. We met up with Hans and Paul (also on your site), riding from the south to the north of France. Our routes never crossed (we travelled just a bit to the west of their route), but we met up when we were only 15 kilometers apart. Unfortunately, we had to leave our horses in the pasture and ride to them in a hired car! We discovered too late that we were so close by... Our horses had a day off, and they were on their way to a friend's party. We had some tough times too, because two of our horses were ill - both have recovered fully. Halfway through France, Truska most probably had 'tying up' disease, despite all our precautions. Even worse, Roos picked up piroplasmosis from a French tick and almost keeled over when the Spanish vet treated the resulting anemia with an shot of iron... We now know she's allergic to the stuff. The vet must have set a new record running to his car and back and injecting her with an antidote. Seconds later, she was already eating again. Phew! The good news is that we have raised enough money to adopt a horse for handicapped riders for a period of two years, while doing that which we love most of all: trail riding! All you Long Riders or hopefuls, have fun on the trail! Congratulations on completing your journey - and on raising enough money to adopt a horse! For more information about the road to Santiago, please click here.